Space Taxi: Archie Takes Flight marks the debut of a brand new chapter book series from New York Times bestselling author Wendy Mass and teacher Michael Brawer, with illustrations by Elise Gravel! 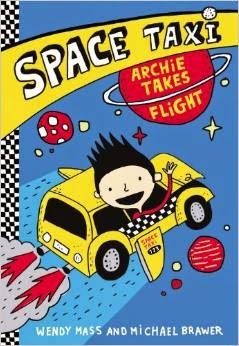 Space Taxi is the hilarious, fast-paced, action-packed story of eight-year-old Archie Morningstar, who embarks on what he thinks will be an ordinary "Take Your Kid to Work Day" with his father, a taxi driver. What he doesn't know is that there is nothing at all ordinary about his father... or his father's job! Without giving away too much of the story, the reader can expect to encounter a multitude of other-worldly creatures, outrageous adventure, and even fun scientific facts. The cartoonish illustrations and cover art really help bring the story to life, as does the first-person narrative writing style. Space Taxi is a brilliant introduction to science fiction for young readers, cleverly intermingling science facts with the story line. Though recommended for readers from age 6 to 10, I believe it is truly is a read for children of almost any age. I loaned my copy to a friend whose 4-year-old son simply adored hearing it read aloud by his mom, and had my 10-year-old daughter read it as well (her assessment: "hilarious and wacky!")! So whether you read it with your child, or your child reads it for him- or herself, Space Taxi is an entertaining, educational, and creative romp through the galaxy! But the fun doesn't stop with Archie Takes Flight... the Space Taxi series also features, Water Planet Rescue, and, now available for pre-order on Amazon for April 14th of this year, Archie's Alien Surprise! All three make a great gift for the little reader in your life, and are available in hardcover, paperback, and Kindle formats, so order your copies today! The 411 for a 911! 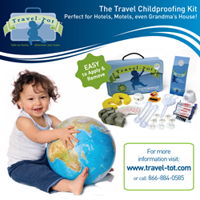 Opportunity for Families Who Love to Travel! Get Motivated: 3 Reasons Family Travel Rocks! St. Patrick's Day: Family Fun!